After a couple of flights with 1.0.7.1, I have not had the auto throttle idle the throttles on its own in PROF or in IDLE CLAMP (when pulling out the ALT knob), NOR will it pay any attention to hardware throttle or pressing of F1 to bring them to IDLE. However, if I use V/S mode, then lower the selected speed, the throttles WILL go to idle, then you can engage PROF and IDLE CLAMP mode and it will keep the throttles in idle as it should. 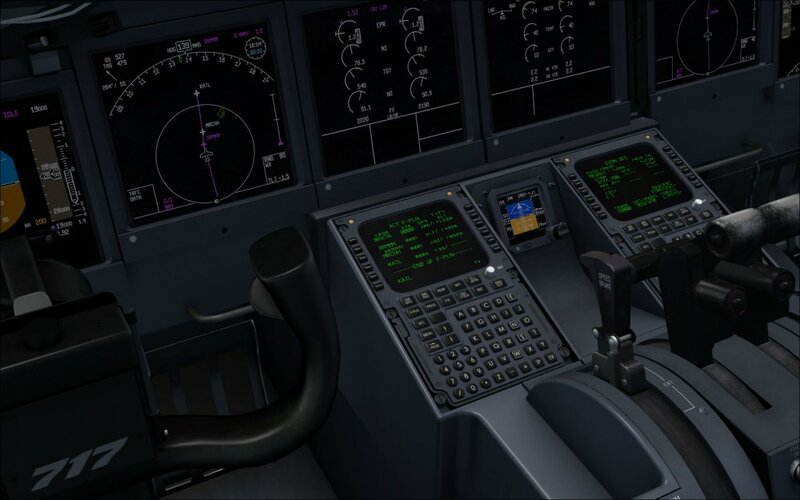 If the correct way the real aircraft operates is to rely on user selection for the throttle, then I would expect it to let me idle my hardware throttle or press F1 during that particular mode, which it is not doing. I am not able to recreate this - could you possibly create a video of it? I just completed a flight, and this time at least pulling out the knob for IDLE CLAMP worked fine, the throttles pulled back to idle pretty quickly. Didn't get a chance to test out the PROF descent. I'll try to get a video or a better description of the sequence of events necessary to recreate it if I have it happen again. Please do - I'd love to get it sorted. Wasn't able to get video, did get some screenshots that i'll post up here if needed later (let me know). EXCEPT - for one flight (after i'd reported this originally), I forgot, and left them all the way forward.... I then happened to notice the A/T on descent idled the engines as expected that flight when I pulled out on the ALT knob... So then, on the next couple of flights, I continued to leave the throttles on my quadrant all the way forward, and when pulling out the ALT knob the 717 continued to idle as expected. So for the last flight i just finished, I decided to pull my throttles back to idle while still in PROF CLIMB. THIS time, when it was time to descend later, the throttles would NOT idle when i pulled out the ALT knob, would not respond to "cycling" the throttles on my throttle quadrant, nor respond to the F1 command. Unfortunately, i also decided to leave the A/T on all the way down during landing, and also noticed i couldn't idle it on touchdown with my throttle quadrant, either (yikes! ), until some combination of F1 and F2 or below a certain speed or something finally seemed to "free" it. Fortunately i managed to do so with plenty of runway to spare, so no harm this time For the record, it's only been the last couple of flights (where i'd been leaving the throttles all the way forward ) that i was "trusting" the A/T and leaving it on during descent - all the flights prior to that i'd been hitting the AFS Override switches and taking over manually. (FWIW, even though the speed protection is pretty close to my APP speed, the A/T is doing a really good job of not letting the speed fall enough for speed protection to kick in, so THAT'S good anyway! ). Again - could be coincidence, but a few more test flights may prove it out one way or the other (unless someone can recreate the same thing in the meantime). I have some things to do tonight, but if needed still when i'm done, i'll upload my screen grabs from this flight. Also have a forced persistence save from the maint menu i did a few min before i turned in to face the runway for approach, which i can also upload if you think it may help. Hmm - does this happen with the newest update? We changed the throttle control system quite a bit. Yes, I am on 1.7.0.4. FYI - most recent flight - left the throttles all the way forward and didn't touch them before descent, and sure enough, both PROF and pulling out on the ALT knob resulted in the throttles pulling back to correctly idle in under 10 sec. Saved a flight and a persistence save just before TOD, so if needed, i'm going to spend a bit much later today firing up that flight and persistence save, making sure my throttle level prior to beginning descent is the only variable that I know of that's changing, and see what happens. Are you able to send me a persistence save created while the throttles aren't idling properly? That'd be optimal, as I can see what's happening at that exact moment. Wellll.... I can't reproduce it on-demand with a save from right before TOD from a flight where all worked well.... So I don't have a persistence file taken while the throttles weren't idling properly in a mode where they should be... However, I DO have one from about 15 min later in the flight the screenshots were taken from, I will attach it here. It may or may not show anything, but no harm in uploading anyway I don't remember what mode the AP was in when I took the save, unfortunately. Also as I've noted, I can MAKE it go to idle using a different mode (like using VS mode for descent and setting a lower speed), then once the throttles idle I can pull out the ALT knob and it will STAY in idle. So if the throttles are idle in this save, that would be why. I WILL make sure to grab one and hold on to it next time I actually have it actively happening though. Managed to get it to happen on a little "ferry flight" from KMDW to KDTW I did just to try to get this to happen again. - "Ferry_During_Climb.xml" is the persistence save during my climbout. - "Ferry_descent_before_TOD_no_idle.xml" is where ATC told me to descend, which was before TOD, so I set the ALT below cruise and hit PROF, then pulled out the ALT knob, and the throttles would not budge on their own, nor with input from my hardware controller or pressing F1. - "Ferry_descent_after_TOD_no_idle.xml" is me trying to pull out the ALT knob AFTER i'd passed TOD, throttles also would still not budge. - "Ferry_PROF_after_TOD_no_idle.xml" is my trying to hit PROF just after the previous noted capture, also to no avail. Really hope this isn't too much, sorry if it is. Hope this can help crack what's going on here!! 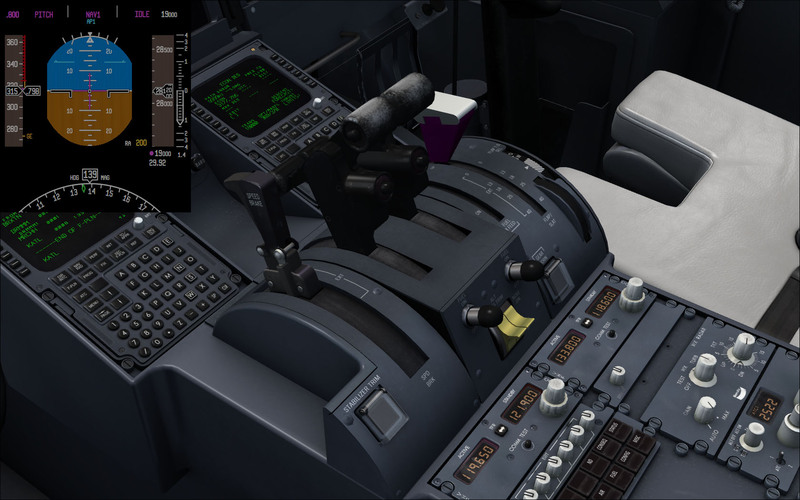 Notice in the screenshots how the right throttle position is positioned a bit lower than the left throttle. Well, if I disconnect the ATS, drag one of the throttles so it is even with the other, then re-engage the ATS, boom! Fixed, and it stays fixed for the rest of the flight. I know my left and right throttles in my throttle quadrant aren't even anymore (and it's only a decade old, too... ). Could that be causing something odd to happen when first engaging ATS during the takeoff roll? Has this continued to be an issue recently? Very sorry I didn't see this earlier!! No, this has not been a problem lately. Have done several flights in the 717 in recent days and I have not had this happen at all. It appears to be resolved - awesome!